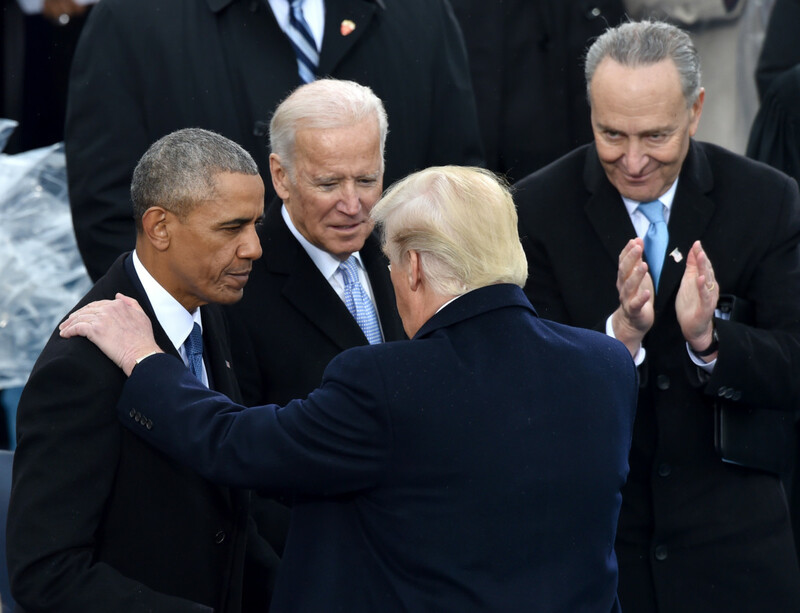 US President Donald Trump speaks with former President Barack Obama as former Vice President Joe Biden and New York Sen. Chuck Schumer look on during his inauguration ceremonies at the US Capitol in Washington, DC, on January 20, 2017. The substance of Fahrenheit 11/9 challenges his fans to go beyond their easy contempt for the obnoxious Trump. Moore pushes his audience to consider how the corporatist blue team — an authoritarian Democratic National Party, a clueless self-serving Hillary Clinton, a slickly betraying Barack Obama and an ultimately pathetic Bernie Sanders — helped elect Trump to the presidency. Moore exposes the Democratic Party’s complicity in Trump’s victory and in US social and economic injustice. Sadly, it appears that Fahrenheit 11/9 will have a smaller audience than previous Moore films. But once Moore feels like he’s given his audience enough to stick with him, he gets to some uncomfortable realities that have real political value, truths that will provoke at least some blue team voters to reconsider why approximately 100 million potential voters didn’t even bother voting — and why Trump won. Moore informs his viewers of some unsettling facts that the vast majority of Americans are unaware of. One such fact is that in the 2016 Democratic primary in West Virginia, Bernie Sanders won all 55 counties—yes, all of them; yet because of the authoritarian and corrupt Democratic Party and the Democratic National Committee, Clinton ended up with more West Virginian delegates than Sanders. And Moore points out that West Virginia was not the only state where this kind of disenfranchisement occurred. Moore, very effectively, links Democratic Party legal corruption to voter apathy and Trump’s victory. Many Americans didn’t bother voting not because they were lazy, but because they felt voting doesn’t matter. I live in Ohio, a 2016 Trump state, and I know Democrats who in the past had dutifully voted for the lesser-of-two-evils Democrat, but who in 2016 just couldn’t stomach Hillary Clinton — and stayed home. I also know Trump voters who actually thought highly of Bernie Sanders and Jill Stein as they were disgusted with both the Democrats and the Republicans, but ended up voting for Trump because he at least seemed willing to blow up the Republican Party. And I know Sanders supporters who have vowed to never take a politician seriously again after Sanders—looking like a POW fearful of being tortured by his guards for truth-telling—gave his support to Hillary Clinton, who his supporters absolutely despised. Moore does not spare Barack Obama, making it starkly clear how little Black lives matter to him — at least the Black lives in Moore’s hometown of Flint, Michigan, the scene of a devastating and shameful water crisis. Flint’s poisoned water supply is a tragedy that is killing and severely injuring its citizens, and Moore shows how it was precipitated and criminally covered up by Michigan’s Republican Gov. Rick Snyder. When Flint residents heard, in the spring of 2016, that then-President Obama was visiting Flint, they became hopeful that surely, he would do something about their water. However, as Moore vividly shows, Obama put a knife in their hearts. The blame lies squarely on Snyder’s shoulders.